In my last blog post, I introduced you to the power of volume analysis. We began by discussing what goes on in trading pits throughout the world as traders of all shapes and sizes yell and scream at each other, signaling trades with their hands. And I showed that it is this ebb and flow of the buying and selling orders (or volume) that holds the key to the market’s direction. In this article, I’d like to expand on my claim that Volume either confirms the strength of a trend or suggests its weakness. Well, let’s look at this image which represents the later stages of a trend. First, I want you to focus on the left side where we see a strong rising trend, along with rising volume. 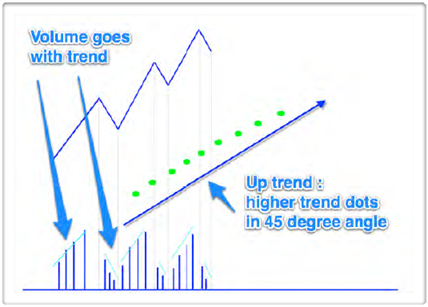 This is what we see when there is a strong trend supported by an increasing number of BUYERS. If there was any SELLING volume coming into the market, then prices would fall, or perhaps move into sideways congestion before falling. But since this is not the case, we can conclude that the volume is BUYING VOLUME, and expect the trend to continue. Now, let’s look at the right side of the image. Here we have a rising trend with falling volume. This combination suggests that the trend is weak. This occurs when the buyers are no longer interested. The trend is running out of steam and becoming exhausted. This is the first sign of a POSSIBLE change in trend. The buyers have left the market, and MAY now be replaced with SELLERS in due course. 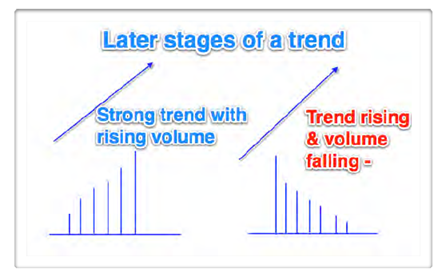 Next, let’s consider this second example that shows how volume goes with the trend. In a rising trend, there are usually pull backs as prices continue higher and higher. During these pull backs, we expect to also see volume to drop off. This is completely normal behavior. This occurs, because the buyers are simply taking a rest before re-entering the market to buy again and again. In a strong rising trend, this will often continue until we reach what is called a SELLING CLIMAX. A Selling Climax occurs when we see something like this. Do you see this ultra-high volume bar? If we are in an uptrend, and we see an ultra-high volume bar like this, then it is a signal that the trend may be about to reverse. This is particularly true if the extreme volume is associated with no equivalent reaction in the price. After all, if the market has failed to rise with significant volume, then clearly the market is resistant to any further increase, and this volume must therefore be considered to be SELLING volume. If it were BUYING volume then the market would have risen strongly. 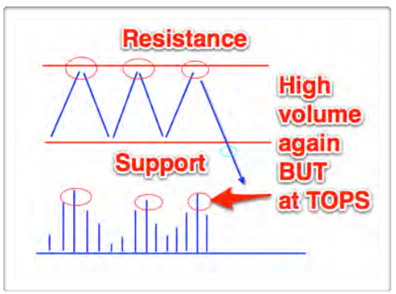 We can see this clearly in the next example that illustrates Price Resistance due to selling volume. Here we can see that the market has been rising strongly, with increasing volume, a positive sign. In simple terms, the buyers are no longer interested at this price and those who are left are gradually being overwhelmed by the sellers who are starting to gain control of the market and a trend reversal is imminent. If the volume bar was BUYING volume, then the market would have continued to rise as in the previous bar. Instead, it has failed to rise and the price spread of the bar is narrow, so this MUST be selling volume coming into the market. 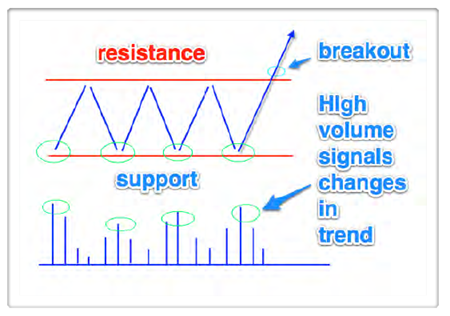 Points where the market trades on high volume are the points of strong support and resistance, and are the first signs of a change in trend or a breakout. Volume helps us to confirm the potential breakout from an area of price congestion. In this example, we can see that we have high volume at the bottom of each market reversal, which is suggesting BUYING or ACCUMULATION at these points. 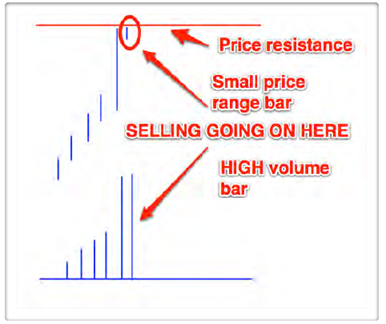 volume bars, that this is a GENUINE breakout and therefore a LOW RISK TRADE. market creating a region of price resistance. the HIGH volume bars on each FAILED attempt to move higher. Once again, we have a low risk entry, confirmed by our volume. The key point is that breakouts and market spikes can be validated or invalidated with the help of volume. Without volume, we are merely guessing at the future direction of the market. With volume, we have an insight into the market, and whether the interest is buying or selling. However, just like price, volume in isolation tells us very little about the market’s future direction. All it can signal on its own is whether there is interest in a market or event. For this, we need to combine price and volume together to give us the most powerful, analytical tool available which is the only methodology that will reveal the market’s future direction. Now, you may be wondering how I became such a proponent of using volume analysis in my own trading. It’s because about a year ago, I had the privilege to spend a significant amount of time trading with Nigel Hawkes, who is the world’s foremost authority in advanced volume strategies.